What did the marketer learn in 2008? What did the consumer learn in 2008? 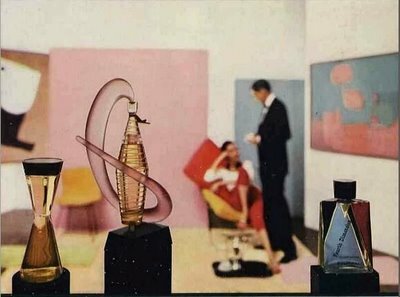 Some highlights I’m proud of are my January–February 2008 series on Middle Eastern perfumery, my Roses for Men posting, my Search for the Perfect Vetiver, and my rebuttal to New York Times critic Chandler Burr. Here’s to a happy and healthy 2009! I am also hoping that the dim economic climate enrobing many portions of the world adds another facet to the rise of natural perfumery, the decline of the great houses, the more widely accepted concept of a fragrance "wardrobe"...and that would an emphasis on quality. Let the marketing follow a good juice, a good bottle, a good concept (& execution), because the fragrance consumer is getting wise enough, practiced enough to hold on to their cash until something that is worth it comes along. I don't understand your first remark, as most natural perfumery is dearer in price than that of traditional, chemistry-aided perfumery, but I will agree that the notion of "brand" (particularly when allied with luxury) has had its comeuppance in a major way. Yes, 2008 was about a wiser, more savvy fragrance customer - quite exciting b/c finally there's a real challenge for the creative directors. And for all the diversity, we need a paradigm shift, a new "No 5" for the 2009-2089 era - in short, something that people can access in extrait, EDP and EDT and which will be readily available to them. And a Happy New Year to you too. ScentScelf- I was thinking more of the prices I've seen by natural perfumers like Dr. George Dodd of Scent Systems, GBP 229.00 for 17mL. When you look at prices of oils and absolutes, it's hard to believe that truly opulent, faceted perfumes (and when I say that I mean extrait strength) can be created for less than mass-market price points. IFRA regulations will be more of an impetus for natural perfumers to create, as like Octavian says on his blog, their goal is basically the eradication of all natural ingredients in mass-produced fragrances. Oh, absolutely! (erm...pun there? absolute-ly? blargh...) Yes, when it comes to quality and complex and small batches, it is hard to compete with mass market. Bulk pricing has its advantages...of course, so does some of the cost-cutting and substitution-ing of which Octavian speaks. Your blog is very much good. I am very much impressed by your blog content, I also come across number of sites for the perfumes for the cheap colognes and discount perfumes, you can also check these are also very much useful for everyone. PerfumeandCologne- This is a blog, not a marketing tool. Please do not use my comments bar as an advertising device; otherwise, I will begin moderating all comments. I thank you in advance for respecting that policy.